As a local Evergreen Realtor, I am always telling relocation buyers about local, historical landmarks. 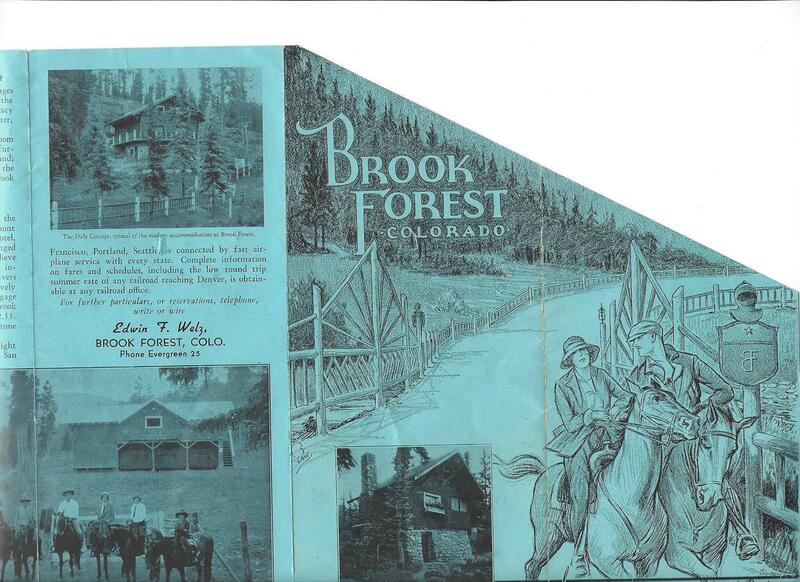 Built in 1909, the Brook Forest Inn has been one of Evergreen, Colorado's long-enduring landmarks. Nestled in the foothills of the Rocky Mountains, the charm of the inn is only slightly shadowed by the legends of the spirits that live there. At the Brook Forest Inn, you can relax by the pleasant brook out back while enjoying a fine dining experience, or snuggle up by one of their roaring fireplaces. In 1909 a small cabin was built on 350 acres that was filed as a homestead by the Westerfield family. Two years later, a harsh winter forced the family away from their land. Edwin and Riggi Welz heard about the abandoned homestead and decided to settle on the land. Upon inspection of the cabin, they found a sign on the door that read "Brook Forest". 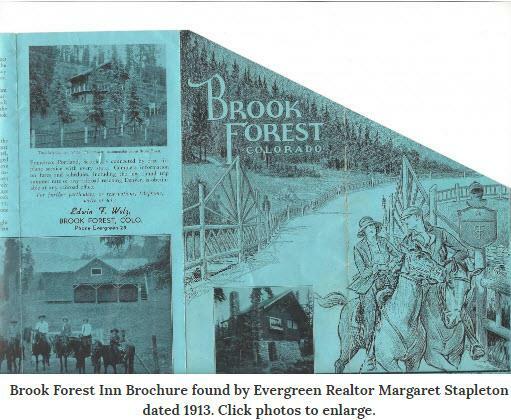 The Brook Forest Inn was opened in 1919. The inn had running water, electricity, and baths, which drew many there. By 1935 business was booming. Horseback trips up to Mount Evans were a much loved adventure that the inn was well known for. And now, on to the more eerie side of the inn. In 1943 a stable hand, Carl, murdered his lover, a chambermaid named Jessica. After the murder, Carl retreated to the livery where he committed suicide. A little boy, who is said to be the son of the Welzs, passed away from influenza. With the deaths that have occurred at the inn, their spirits may roam the rooms and halls. Guests of the inn and residents in the area have said they have seen apparitions and heard giggling and voices. "We were awakened in the middle of the night by what sounded liked a child running down the hall very fast," our own Larry Hotz, All Denver Real Estate Executive Editor told me. "It was 3:30 am and I went to the door to see what happened. No one was there. When we mentioned it at breakfast in the morning, the proprietor told us the story. He said it happens all the time." Make a trip up to the inn and decide for yourself. The spirits do seem to be friendly and playful. 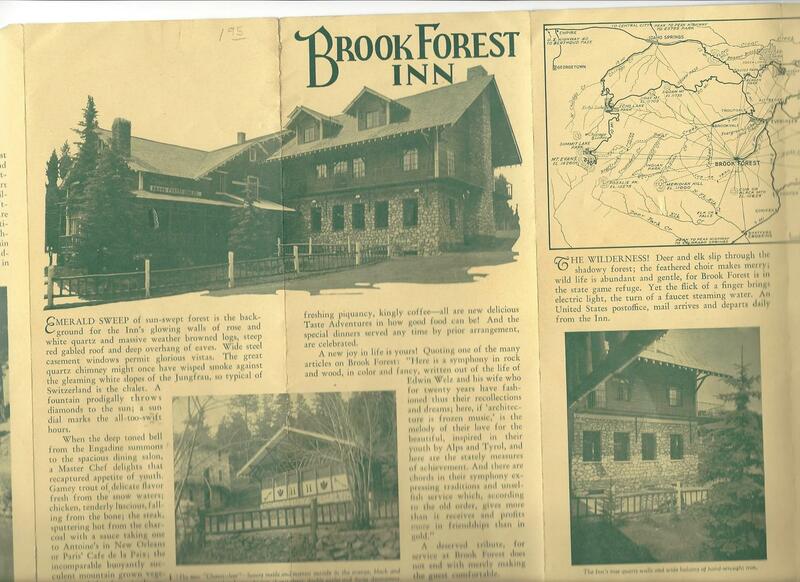 Local lore is that before the outbreak of World War II Nazis frequented the Brook Forest Inn. Their purpose was to crisscross the country to make maps for Hitler in preparation for an invasion. Some even say that swastikas can be found throughout the inn including a large one under the large carpet in the dining room. There are also rumors that Nazi gold is buried on the grounds although nothing has ever been found. Now, small cabins and some substantial homes are occasionally for sale in the surrounding neighborhood. It seems that Denver relocation buyers from out of state love these little pocket neighborhoods nestled in little canyons near Evergreen. The road to the Inn is quiet because only these few homes and Inn are served by the winding road up the hill. But, be careful not to be distracted by the real estate for sale or the wildlife, including deer, you sometimes see. The road is curvy and there are many hidden driveways. 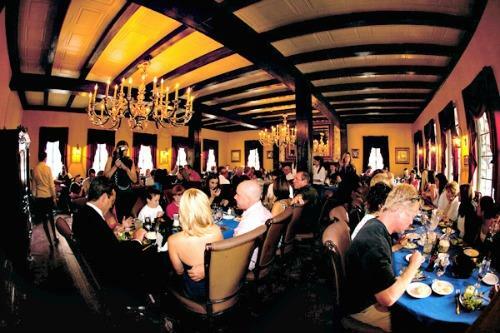 The Historic Brook Forest Inn with its excellent food and delightful surroundings is a great place to spend the weekend. With its short distance from Denver, you can forget the big city here.